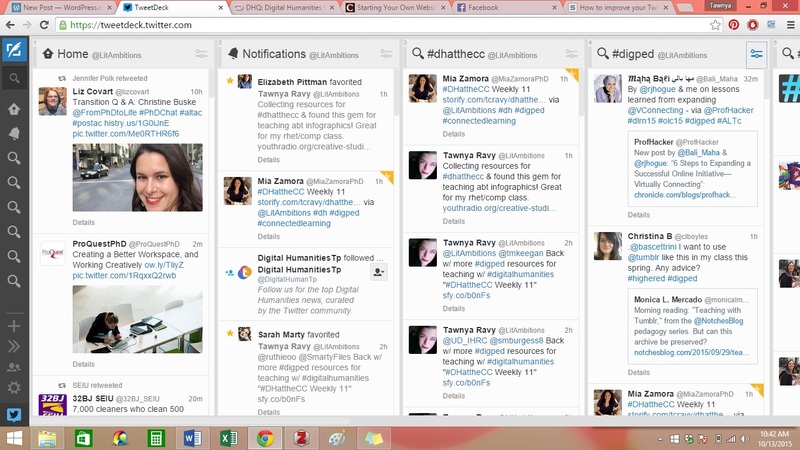 On October 2, 2015 Hybrid Pedagogy hosted a #digped chat on the Death of the Discussion Forum to discuss not only the often stilted nature of using discussion forums in course management systems, but also the comparative merits of other discussion tools like Twitter. The conversation included a debate about the pedagogical merit of asynchronous versus synchronous discussion formats with some commentators pointing out that asynchronous discussion is more common than we think and has its own value. Jesse Stommel, who has written and taught extensively about the merits of using Twitter in the classroom, points out that Twitter offers a dynamic platform for rhizomatic discussion as opposed to discussion forums which rely on linear discussion threads. Anyone who has attempted to use a discussion forum in a course management system like Blackboard knows that it is quite difficult to not only get students to engage actively and often within a discussion forum, but also to convey the pedagogical importance of such engagement. Somehow the synchronous discussion that takes place in the classroom seems more legitimate to the average student than the asynchronous discussion in a forum. Of course, I would suggest that much depends on how the teacher handles the platform. We all know how classroom discussion can fall flat on its face. And I can cite from experience at least one class in which the discussion forum on Blackboard proved to be one of the most central features of the class. How did my instructor accomplish this? Each week he asked us to post our critical views of the week’s reading in a thread in the discussion forum. We were not allowed to reiterate one another’s critical views, but we could refer to one another’s posts in our own posts as a jumping off point. The effect of this was to encourage us to post as early as we could to get the “good stuff” first, but it also forced us to read each and every post that proceeded ours to make sure we weren’t reiterating. It also forced us to really dig into the readings to produce “new” knowledge about them should we be one of the last-minute posters. He also set the deadline before the start of class so he had time to read through them all. He began each class by highlighting the particular posts that he found most productive and helpful to our discussion. The effect of this was twofold: it connected the online forum directly to our class and it made us strive to write “the best” posts that we could in order to be among the posts mentioned at the start of the class. While his approach did not necessarily “succeed” in terms of getting us to spontaneously “chat” in the forums to one another about the material, it nevertheless produced tangible benefits for the class. Now that I’m an instructor, I can certainly find value in a method that prompts careful reading of the texts before the class begins and that generates pride and ambition for one’s low-stakes assignments. Try as I might, I can never quite replicate this success with in-class writing assignments, and I tend not to like assigning these as they disadvantage my ESL and LD students. But beyond careful reading and writing, are there other potential benefits for using discussion forums? I would suggest there are, especially if we think about the value of sharing work and collaborating – most students work within isolated silos at least until rough drafts are due for peer review. It might be beneficial, however, to have them read more of each other’s work more often even if it doesn’t necessarily spark conversation. That being said, I find myself seriously considering the options before me for digital synchronous discussions with students. As you may have read, I am teaching two hybrid classes for the first time this term. I am also in the process of taking my last “module” for online instruction with my institution. How to create successful “blended” learning environments is ever on my mind these days. For me it all began when I found myself wishing I had a way to “push” links and resources to students without having to log into Blackboard, go to tools, create an email and/or add a new link/file. These steps alone prevented me from sharing things as I discovered them with individual students whose projects were on my mind and/or the whole class. Sometimes I got lucky and happened across something relevant while I had blackboard open and could easily drop the link in. But only rarely. While this might seem like a teaching “extra” that really doesn’t warrant a whole blog post, it is, in fact, integral to my instructional philosophy. I want students to see that learning is a dynamic, organic thing that can exist outside of the classroom, Blackboard, and library databases. I want them to know that even though I’m juggling 120 of them every term, I remember what they’re working on (sometimes) and care enough to send them things that might be helpful to them. So I contemplated setting up a Facebook class page into which I could post links that students could see in their feeds (without being my Facebook “friend” necessarily) or online (without having a Facebook account of their own). I considered this platform for a number of reasons. 1) Selfishly I am already on Facebook and find it easy to transfer knowledge and information in this manner (within Facebook itself, but also between other platforms I use as well) and 2) The data suggests that whatever Gen Y thinks of Facebook as a social media tool, most still have accounts and are thus likely to already know how to use it, etc. I also have a model for this as one of my graduate instructors used a Facebook group in order to communicate with us. I found it fairly effective, if somewhat one-sided since many of my fellow graduate students rarely used social media platforms for anything like work at that time (now of course is a different story). While I have doubts that Facebook can accomplish what I hope for in digital communication with my classes, it is still a possible avenue for my future course designs. The essential element it lacks, however, is the connection to wider discourses that other platforms, like Twitter, offer. One of Jesse’s major points about Twitter is how it enables students to see class materials and discussions within larger discourses. It pulls the discussion outside of our specific class spaces and into the wider world. Students can engage with other scholars, pose questions to authors and celebrities, follow important hashtags, study Twitter stats, analyze tweet rhetoric… The possibilities for engagement are not quite endless, but every week I seem to see new ideas for how to use this dynamic platform for higher education. I also see fairly consistent push back from teachers and students on using Twitter as an educational tool. First, there are concerns with privacy. While these are legitimate concerns, my view is that even if you were to maintain the strictest standards for privacy, there are still many ways to use Twitter in the classroom safely. There are some tools (like TodaysMeet) that allow you to emulate Twitter’s synchronous chat function but only for your invited participants. There are other ways around having students create their own accounts in order to tweet (like GroupTweet). Finally there are a myriad of ways to protect your privacy on Twitter, although some of the measures you can take defeat the spirit of the thing (specifically joining in a wider conversation about the course material with others). Just as with any new technology or method, it helps to address it openly and fully with students. Assign opposing viewpoint readings, go over their privacy options in class, open a discussion with students about their concerns. Which brings us to the second objection: The Purpose. Students (and teachers) who are somewhat familiar with Twitter, and even regular users, might be used to thinking of it in one specific way. You’ve probably heard the description of Twitter as short updates on menial things: “I put on socks today.” While it is true that tweets can consist of unimportant fluff, this type of thinking trivializes what is, for many of us, a space of professional networking, job searching, crowd-sourcing, research, and scholarly conversation. For students it might be a combination of thinking it is trivial and/or purely for social (non academic) engagement. I have one response: modeling. Just as you would use models to explain how (and why) to write a certain way, so should you model the ways in which Twitter can be a learning community. In my Composition/Rhetoric class this term, we will be analyzing the rhetoric of #Blacklivesmatter as part of a semester-long discussion of rhetoric relating to policing and racism in America. Not only will we have readings on the Twitter content, but also on rhetoric and Twitter more generally. I cannot arbitrarily expect them to find value in analyzing the #Blacklivesmatter conversation without showing them its reach, its participants, how it impacted non-Twitter media and policy, etc. (This, by the way, is another example of how you might use Twitter in the classroom without having anyone sign up for anything). If I were to ask students to create Twitter accounts, I would make sure to show them my own usage of the platform for scholarly conversation. I can hardly expect them to be enthusiastic about a platform that I myself don’t use on a regular basis. So are discussion forums dead? Are they on life support (and if so, should we find a way to breathe new life into them)? My experience says that as long as online or hybrid classes are structured the way they are now, we will not be able (or necessarily desire) to abandon discussion forums. However, it benefits us all to consider more carefully how and why we seek to cultivate class discussion outside of the classroom and especially in blended or online learning environments.